Recently, LHSA has been fortunate to receive several new items for the collection and for the past few sessions, I have been preparing these for archiving. Having been issued an accession number by the Archivist, the items have to be checked here in the Conservation Studio before being catalogued and permanently preserved. Each piece is examined to ensure its own general stability and also that it does not pose a potential risk to the rest of the collection. Some of the things I have been looking for are extreme dirt, infestations of any kind, signs of mould, folding and general disorder which could lead to tearing, and staples and paperclips which could rust. I came across examples of many of these things amongst the accessions and found myself straightening up lots of piles of notes, removing excessive metalwork, surface cleaning some extremely dirty files, and placing a jotter in a box of its own for a few weeks, just in case the long-dead spider that I found had left any offspring! I also came across a large number of photographs, which I placed in Melinex sleeves for their protection whilst being catalogued. Although many accessions appeared to have no specific order to them, that is not something that I know for certain, so I had to keep things in the order in which they came. This had its difficulties, as the accessions contained a huge variety of items, including bound books and textiles, and many records have photographs paper-clipped on at relevant parts of the text. I have had the opportunity to really think like a Conservator and try to decide what is best for the item and how it is understood. 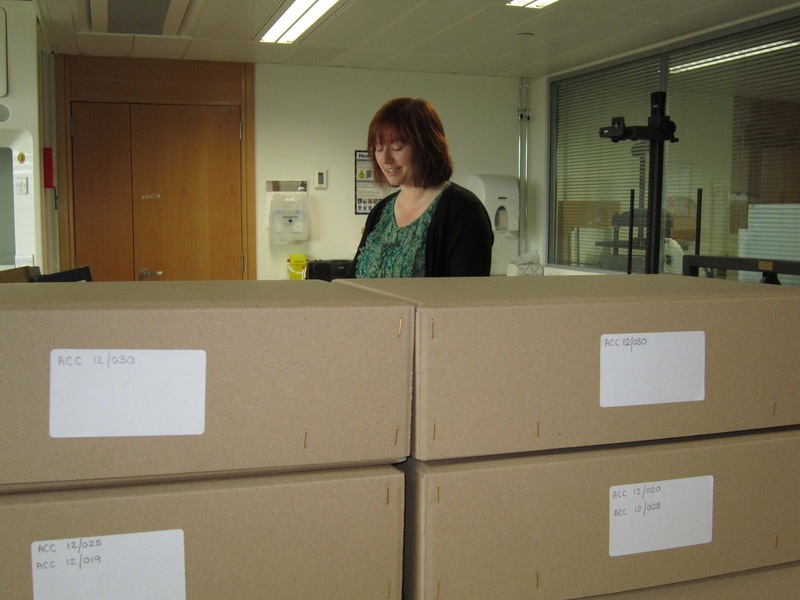 After this work, the accessions are placed in acid-free folders and low-acid boxes to go back to be catalogued. Some, such as large document folders and textiles, needed custom-built folders. This batch of new accessions covered everything from a nurse’s linen laundry bag from her student days and 50-year-old patient files to photographs of Doctors’ Boards. The most wonderful piece for me though was a book of poems, pictures and messages to a wartime nurse from the many injured soldiers she had cared for. I so enjoy my time here as I never know what will be coming my way next. 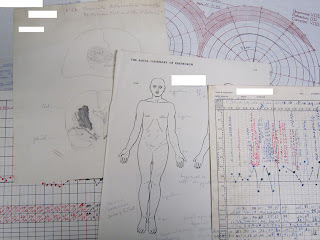 Documents contained in a Dott case note folder from Bangour General Hospital: typed case summary; temperature chart; hand-drawn sketch; body examination chart; perimetry chart; and operation chart. Personal patient details have been redacted. As the end of the second month of our project to catalogue the neurosurgical case notes of Norman Dott approaches, we are reaching the completion of its first phase, which focuses on research and methodology. A large part of this research has been devoted to assessing the contents of case notes in the Dott collections – and one conclusive finding of these two months has been that there is no such thing as a ‘typical’ patient case note, just as there is no such thing as a ‘typical’ patient! The idea of cataloguing case notes (particularly in such large quantities) for thousands of individual patients may sound a less than inspiring one to someone unfamiliar with medical records. Many people are unaware of the range of information and types of material a case note can contain, as was I before I had volunteered and worked with medical archives. However, on closer inspection, an image of case notes as dry, impenetrable forms packed with incomprehensible abbreviations could not be further from the truth. Although it cannot be denied that many records in the Dott collections contain typed “forms” (which undoubtedly help to pinpoint the key information that we need in order to write catalogue entries), what is included in a case note folder varies with time and is very dependent on the medical condition (and personality!) of its human subject. For example, in Dott’s early days in Ward 20 of the Royal Infirmary of Edinburgh, many case summaries were handwritten on small notepad paper, and no typewritten forms were used. Other case note files may only contain correspondence after Dott was asked for opinions from general practitioners around the country. The case note files in this project contain a huge variety of documents with a wealth of information for researchers: laboratory reports, operation, examination and anaesthetic charts, medication dosage tables, newspaper clippings, letters, postcards, and examples of handwriting and drawing used to measure the dexterity of patients before and after operation, to name but a few. Some of the most fascinating and enduring records of Dott’s work are in the form of images, including photographs, slides and x-rays – not to mention clinical sketches made by Dott himself. Particularly interesting are photographs resulting from angiograms (x-rays used to examine and reveal blood vessels through the use of a special dye), an important diagnostic tool for Dott – in fact, he was the first in the United Kingdom to correctly diagnose cerebral arteriovenous malformation through angiogram with sodium iodide dye in 1929, and the first to demonstrate an intracranial aneurysm using angiography in March 1933. Photographs were often produced from x-rays, and were also taken on the ward to show changes in appearance that resulted from medical conditions, or to document the cosmetic results of operations. Case notes are not only records of medical procedures, they tell stories of clinical discovery, can witness lasting relationships between doctor and patients through correspondence over decades, and reveal individuals’ capacity for courage when most vulnerable. In the completion of a detailed catalogue, we hope to make these stories and discoveries accessible to researchers for a very long time to come. The lecture series began on 3 October at the City Chambers, with a talk by Professor Andrew Scull of the University of California, San Diego on ‘Madness Confined’. We were delighted that he gave our Archive Appeal a plug, reiterating the importance of late-twentieth century records and the dangers of their disappearance from the historical record of the Hospital. Scull started by describing the feelings surrounding psychiatric hospitals in the 1950s: they had become places of ‘degradation’, physically decrepit and socially unacceptable. At a time when the population of these hospitals had begun to decline, there was concern about what would become of the decaying buildings. This view was in stark contrast to the early nineteenth century when the Royal Edinburgh Hospital (REH) was founded. Jonathan Connolly, a contemporary English psychiatrist saw asylums (as they were then known) as places to “restore tranquillity”. His Scottish counterpart, W.A.F. Browne believed in ‘moral treatment’, a move away from the eighteenth century ‘madhouses’ which, established in a period of little regulation, were essentially private enterprises, making money from the ‘trade in lunacy’. There was a great variation in the quality of care and some became notorious, such as Bethlem Asylum, rebuilt in 1676. The use of space was a key feature of the reformed asylums and the layout of the REH was no accident of design. In contrast to the converted mansions from which the old ‘madhouses’ were usually made, the new asylums were designed to a plan: science and humanity were to be employed to counteract barbarity in a utopian experiment. 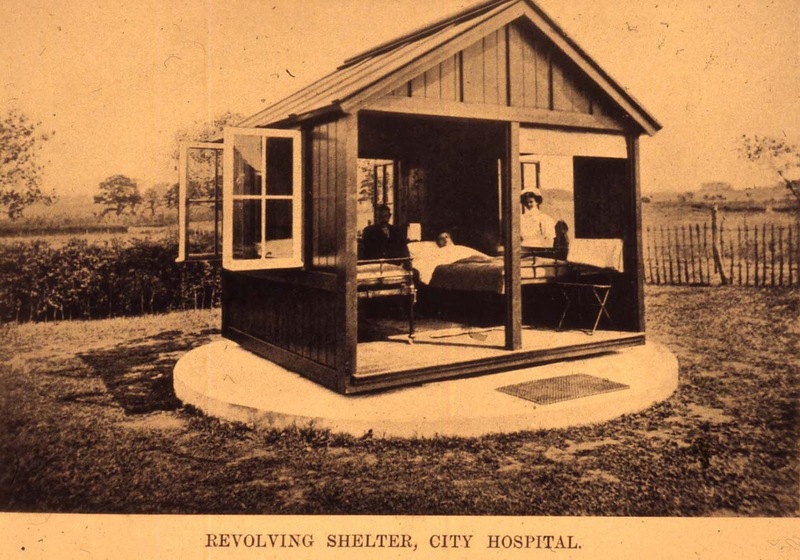 Despite the public scandal whipped up by a series of investigations, change was slow to arrive: public asylums were expensive to build, and doctors at private asylums had a powerful voice to lobby against change. It was not until the Lunacy Acts (1845 in England, 1857 in Scotland) that it became compulsory for parishes to use public money to provide care for the mentally ill, and a Commissioner in Lunacy appointed to oversee them. W.A.F. Browne became the first Scottish Commissioner. His belief in ‘moral treatment’ included the idea of classification: separating the most disturbed patients from the calmest, and rewarding ‘good behaviour’. This proved to be less successful in big asylums, only working in small enterprises, and the numbers of long-term patients grew. Asylums became strange places, isolated from the communities they served. In 1845, there had been 12,000 asylum patients in the UK but by 1900, this had risen to 100,000, hence the vast institutions that had become so discredited by the 1950s. This talk provided the context for the setting up of the REH, and some of the therapeutic ideas prevalent at the time. It set the scene for the seven lectures to come and we look forward to John Burnett’s talk on sport and health at the REH on 14 November. Please visit our website to find out more about the lecture series, and there will be more to follow about our Archive Appeal. Continuing an occasional series of blogs on LHSA's collections relating to specific hospitals, this week focuses on the City Hospital. This Hospital had its origins in the Public Health (Scotland) Act of 1867, which gave power to local authorities to make provision for outbreaks of infectious diseases. Between 1871 and 1879, the Town Council of Edinburgh provided hospital beds for diseases which would not be permitted in the Royal Infirmary of Edinburgh (RIE). These services were set up in various locations including Canongate Poorhouse, King’s Stables Road and Forrest Road. After the RIE moved to Lauriston Place in 1879, the Town Council purchased the Old Surgeon’s Hall and some buildings from the previous site of the RIE in High School Yards for the provision of a fever hospital, and this complex of buildings became known as the City Hospital. A new hospital designed for this purpose was opened in Colinton Mains, south-west Edinburgh in 1903. On the creation of the NHS in 1948 the City Hospital joined Edinburgh Royal Victoria Hospital Group of the South Eastern Regional Hospital Board. From the 1960s the Hospital started to take in patients with other ailments such as tropical diseases and from the Ear, Nose and Throat department. In 1974 it became part of the South Lothian District of Lothian Health Board. It closed in 1999 as its services were transferred to the new RIE at Little France. LHSA’s records for the City Hospital (reference: LHB23) include staff and patient records, registers of diseases (including tuberculosis, meningitis, measles and scarlet fever), photographs and some editions of the City Hospital Magazine. The disease registers are an invaluable resource by which researchers can chart outbreaks of infections in the city of Edinburgh at various times. 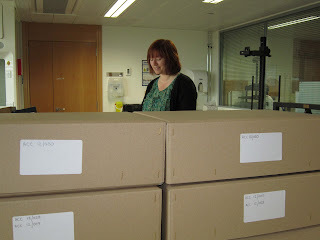 For more information about the material we hold for this Hospital, please see http://www.lhsa.lib.ed.ac.uk/collections/LHB23/LHB23.pdf. Before the invention of antibiotics, few treatments were available for sufferers of tuberculosis except rest, fresh air and sunshine. 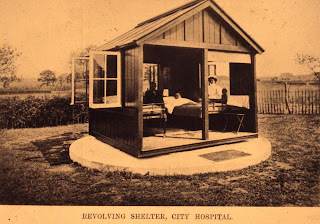 The image, which dates from the early 20th century (reference: Case 118.5), shows a revolving shelter from the City Hospital designed so that patients could get all three of these at once on sunny days.